We use XenServer in our cloud, and has shown to be efficient and minimal overhead. We also use VMWare but due to its price, we limit the number of instances. and we have used VirtualBox in our laptops. We can then run Windows over Mac, Mac over Windows, and many other combinations that enable a wide flexibility of software packages that with a good machine, can clearly be of use. A docker container is nothing but a file, just as the hypervisor runs a VMWare or XenServer image. In this case, the Operating System, let’s say Ubuntu will handle all the context switching and management of the Docker behavior as a process. 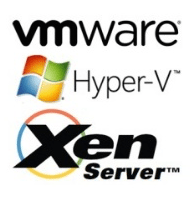 XenServer is a hypervisor, which I am very familiar with. XenServer can be installed in almost any hardware and the VMs can be moved and ported over each XenServer instance. As you connect with the XenServer box, you may be able to launch or start the VM and have access to its console. The process of connecting to the XenServer is used by using the standard VNC prfocol with usually ports 5900 and beyond. An overkil seeksml in many cases, as you may have for example a XenServer machine running one or several virtual computers. Let’s say you decide to load Ubuntu 14 LTS on XenServer. The ubuntu machine is ready to go after a while, and then you run a docker container on top of this configuration. However, Citrix understands this situation and has created a supplementary pack for Docker. Once you install this supplemental pack, XenServer is aware of a container managed VM. 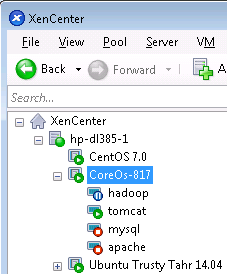 As shown in this capture, The machine hp-d385-1, has a virtual machine called CoreOS-817 and includes a hadoop container, tomcat, mysql, apache, that can be launched from the XenServer user interface. You may think? XenSserver->Ubuntu->Docker ? Will this be too much overhead? I have not done the bechmarking comparing XenServer with Docker. However, a paper was presented showing a performance comparison. 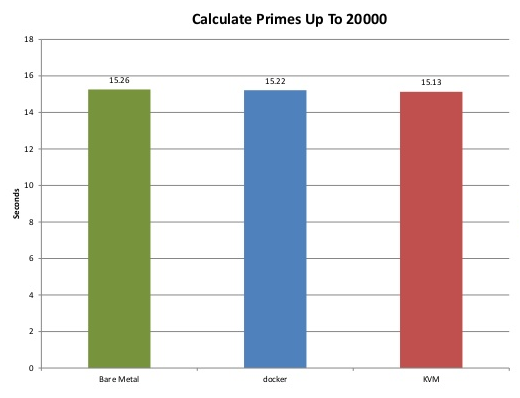 While the performance calculation shows a similar result between a KVM, Docker, and just the bare metal. More studies are required to confirm performance. Further analysis is required to really determine if a Docker container running on a native machine shows a higher performance than a KVM with a docker instance. Docker simply comes to solve a problem using a native environment, using a hypervisor is just unnecessary and not required unless you really need to use an image that was built, tested, and validated for a particular Hyper-V Or you believe you have a special hardware that the Hyper-V can handle or arbitrate better than a version of Linux you may have. One special case is running Windows container on Linux. Apparently Windows showed in 2015 how to run a docker container on Windows, however the opposite seems to be a problem.